In an IB teacher meeting scheduled by English teacher, Michael Vergien, we decided to embark on an intercurricular discussion about the referendum in Scotland over the possibility of its separation from the United Kingdom. We all contributed ideas as to what could be discussed in each of our respective disciplines. On the first day, each small group chose one factor that would quantifiably have an impact on whether voters may want to separate. Each group then researched that factor as it pertained to Scotland’s government, economy, and people. As I walked around listening to the discussions, I was fascinated at the different approaches as to what was important, and how they could attach a numerical value to vague concepts like nationalism. There was a lot of good research done, and a lot of consideration to the demographics of the voters in five years, as it compared to the voters that had just voted in this year’s referendum. 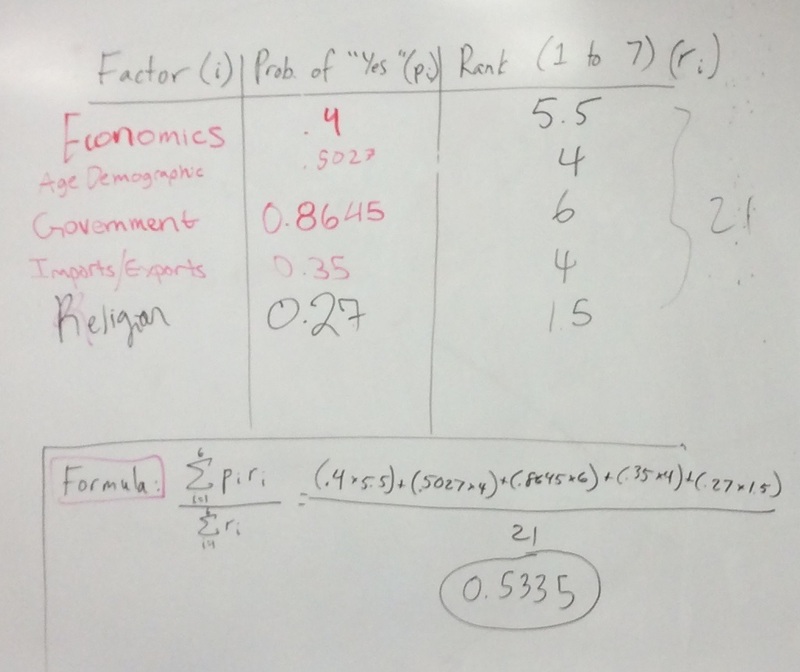 On the second day, each group was asked to figure out what percentage of voters would vote for separation, based solely on the factor that they researched. 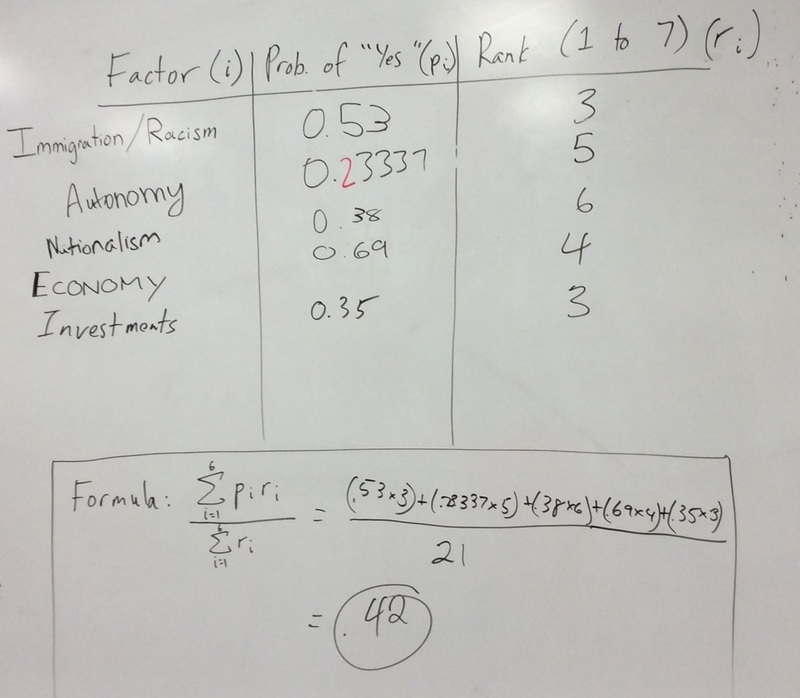 Then, as a class, we ranked each factor from 1 to 7, with 7 being extremely important. Here’s where the math came in. 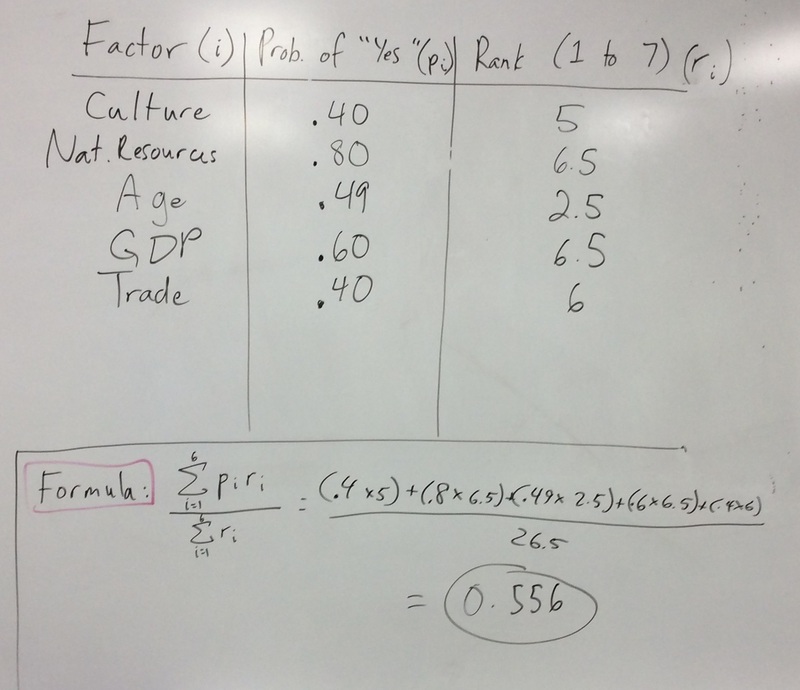 Using a formula that is similar to the formula for expected value, we multiplied each probability by the respective ranking, added it all up, and divided by the sum of the rankings. This allowed us to find the approximate predicted percentage of “yes” voters five years from now. Admittedly, there was some guesswork, but in the end, I feel that the exercise of taking mathematical concepts and applying them to current world events proved invaluable. It’s always nice when teachers get the opportunity to plan out the entire year so that they know exactly what will happen on each day, but I now see the value in breaking away from the schedule to look at the real world and apply theoretical concepts to the reality around us. I have grown to embrace the unexpected – the problems with many right answers – and this experience now has me looking more closely at the most current world events to see how I can create a learning experience out of them. Thank you to Michael Vergien for the idea, and to Karie Kosh, for brainstorming with me to make this an overwhelming success. 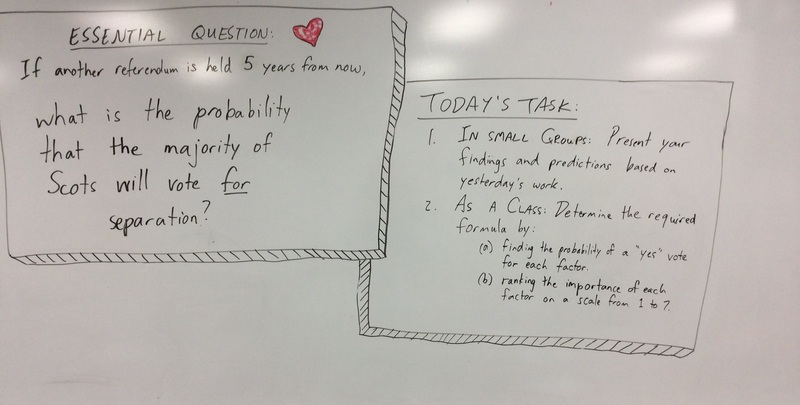 Posted on October 8, 2014, in Flipped Classroom. Bookmark the permalink. Leave a comment.